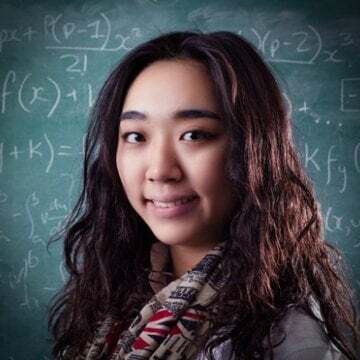 Judie Wang 王毓彤，就讀於赫瑞瓦特大學精算系，預計 2019 年畢業。14 歲時台灣國中肄業，並自己申請了新加坡的留學，語言學校跟政府中學各待了一年。16 歲時雅思考到 7 分，轉學至英國約克，並從中三跳級到高二。18 歲時申請到倫敦政經學院精算系，卻毅然決然去瓦特成為獎學金跳級生。當初相信行萬里路勝讀萬卷書，而有了出國的初衷。6 年下來，自認為學到的軟實力是自己最寶貴的資產。Judie 認為很多時候會走冤枉路要不是因為沒有選擇適合自己的就是因為沒有評估風險。因此，16 歲的時候就考慮以精算師作為生涯目標。現在也已經報上 PwC Flying Start Programme 成為英國普華永道（台灣資誠）的實習生。Judie 對於什麼都有興趣，喜歡團隊合作和旅遊。現在是瓦特台灣同學會的公關， Business Idea Generator 的 founder，同時還是瓦特交響樂團的打擊樂手。用一個電影角色來形容 Judie 是勇敢傳說裡的 Merida，因為她很勇敢的改變了自己的命運，而最喜歡的話是臉書營運長 Sheryl Sandburg 說的 "what would you do if you weren’t afraid?" In 2011, Judie decided to go abroad and study ordinary level in Loyang Secondary school in Singapore. In 2013, she transferred into Queen Ethelburga’s college. Two reasons she left Taiwan are because she can’t fit in Taiwan’s education system, and she wants to learn knowledge outside of the textbook. 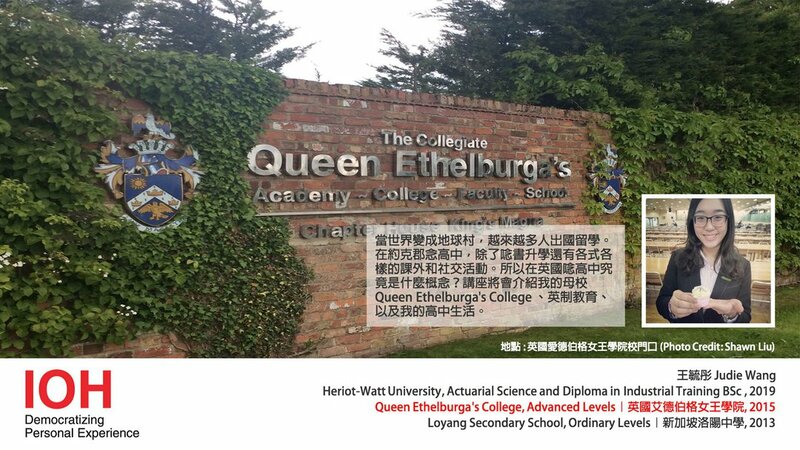 After studied two years of A-level, she graduated from Queen Ethelburga’s college, pursuing Actuarial Science in Heriot Watt University as her future career. Queen Ethelburga’s college is a very historical school in York. It used to be a girl school, but now it is for boys and girls. The original motivation Judie left Singapore and travel to UK is because they have very similar education system, and Queen Ethelburga’s college offer her to jump years. So basicly she jumped to year eleven. Queen Ethelburga’s college is very good at business and science, that is the reason she studied in Queen Ethelburga’s college. Although Judie only studies A-level in QE, QE actually provides education from year one to year thirteen, which is from five years old to eighteen years old. Even though A-level is only two years, it is actually equivalent to Taiwanese high school. There are sixteen people in each class, each class last forty minutes. In total, they will have twenty teaching hours in a week. Unlike Taiwan, the students in QE have four subjects in their first year, three subjects in second years, so basically they get a choice to drop a subject. It’s all up to you if you want to carry four subjects in your second year. They also have exams, and some business subjects they need to do projects. Students will have to write some essays as well. It all depends on different subjects you are taking. How Do They Apply University? Exam is very important to students in QE. They have two exams in two years for each subject. they apply university through a website called UCAS, students get five university choices. They also need to hand in 5000 characters personal statement. So there are six stages: In the fresh year, they will have one exam called AS exam, and after exam they will receive a predicted grade. That’s what students use to apply university. then they will use UCAS apply five universities. After applying, they will receive offer from university. After, they can choose two universities, one is their first choice, and the other is second. Then after their A2 exam, they will receive final grades, the grades will determine which university you go to. Judie was involved in “Young Enterprise”, it is a business program for young students to create their own business or their own products. Her role is a marketing manager. She was selected as a member of “Prefect Team”,becoming a communication bridge among student and stuff. Because she can play percussion, she also played in school percussion called hairspray musical, which she enjoyed a lot. There are also lots of party in QE, such as Halloween party, Christmas party……etc, so students have chances to socialize with people. As for dormitory, two to three people share a room and facilities are pretty well offered, you can choose to cook yourself instead of going out for food.